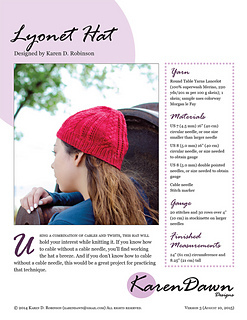 Using a combination of cables and twists, this hat will hold your interest while knitting it. If you know how to cable without a cable needle, you’ll find working the hat a breeze. And if you don’t know how to cable without a cable needle, this would be a great project for practicing that technique. This hat is designed to fit the average woman’s head -- 22”-24” in circumference and 8.25” tall. It is knit in the round on circular needles in a worsted weight yarn. Pattern includes both written directions as well as a chart for the cable and twist section. 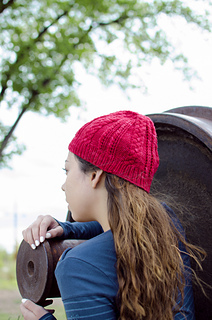 If you would like a slouchy version, work 9 pattern repeats instead of 6. If you would like to try working the cables without a cable needle, this would be a good pattern to try that. I have a tutorial video available to show how this is done. Thank you to my test knitters (bells5r, prizebird, Dmlagas, rosalynk) and tech editor (kwunder) who provided valuable feedback. 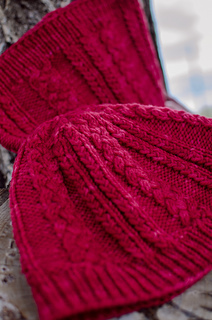 For a matching set, see the Lyones Cowl. Lyonet and her sister Lyones are characters within Sir Thomas Malory’s grand Arthurian story, Le Morte d’Arthur. They are in the section about Sir Gareth. Gareth is the youngest brother of Sir Gawain and he comes to Arthur’s court as an unknown (under an assumed name--and then given the nickname Beaumains) to try to make something of himself without relying on his brother’s reputation. Lyonet comes riding into Arthur’s court seeking a knight to rescue her imprisoned sister, Lyones. Gareth asks for the honor of this quest and Arthur grants it. Because Gareth had been working in the kitchen, Lyonet is not impressed by the knight that Arthur has sent with her to help save her sister. She insults Gareth at every turn. Even though Lyonet has no faith in Gareth’s abilities, he is able to rescue her sister and in return, he and Lyones are married.